Beau’s Gruit Series revisits Lamb’s Wool apple & spice ale December 3, 2018 Beau’s Brewing Co. is bringing its Lamb’s Wool apple and spice gruit ale back soon as a release in the rotating Gruit Series. Lamb’s Wool is a winter gruit that is made with a blend of ale and organic apple juice. Real cinnamon and whole cloves add a warming spice. Beau’s Gruit Series takes inspiration from centuries-old brewing tradition. Herbs, spices and other botanicals replace a dominant hop character, throwing open the door to experimentation in brewing ingredients. A Lamb’s Wool gruit of spices, ale and apples has a long history with Celtic pagan roots. It is a traditional drink meant to be paired with making merry, celebrating friendships, and welcoming good fortune in the year to come. Beau’s Lamb’s Wool pours copper with a white foam. The aroma introduces a classic combination of apples and spice. The flavour is pleasantly tart and slightly warming, with fruit and pepper notes. The finish is clean and tangy. 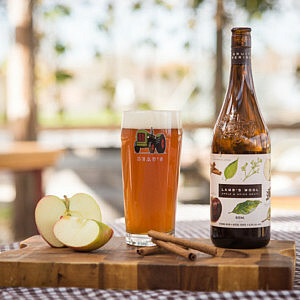 This 6.5 % organic ale is recommended for service at 6-8 C, and pairs equally well with main dishes as with a baked apple crisp. Beau’s Lamb’s Wool apple and spice gruit will be available from select craft beer retailers as well as on tap at select restaurants and pubs in Ontario and Québec, beginning Dec. 6.